The Dell U3415W is an ultra wide screen in the Dell UltraSharp product line. 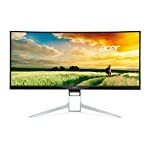 This product line has built up a reputation for high quality screens trusted by professional users and Dell have ensured the U3415W fits into the range. The ultra wide format is still relatively new at the time of writing and isn’t universally supported in games. But this is changing as the format becomes more popular. 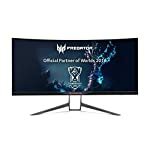 Fans of the 21:9 screen ration talk about the increased game immersion as their field of view is filled by gaming action. The benefits to productivity are also clear, more screen space is always handy when working with Windows applications and some have even used these large screens to replace two side by side monitors, doing away with the annoying join in the middle which inevitably interrupts the display continuity. All this comes at a price and these 34″ ultra wide screens are the higher end of the scale. However as more and more manufacturers compete, for example LG, we have seen prices fall but for now these are still considered premium screens for those looking to show off some impressive looking kit. In many ways the Dell U3415W looks very much like any other model in the UltraSharp range. I don’t think this is a bad thing, the design is smart enough and ensures your display will fit in just fine in a home office. If you are looking for something more stylish or more “gamer” then I can see that you might not agree. It is, I suppose, fairly bland. But either way, it does little to offend. The advantage to sticking to their traditional style is that the stand comes with the full range of movements (well, except a rotate option, that would just be silly!). The size of the panel does make it a bit fiddly to adjust but you won’t get stuck. 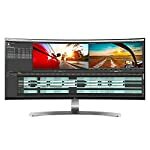 The monitor is solid and sturdy as you’d expect from Dell’s production values, it is everything you would expect from the UltraSharp range. Connectivity is well catered for, it comes with Mini-DisplayPort, DisplayPort and HDMI 2.0 sockets. Also included is MHL for connecting up your mobile device. You get 4 USB 3 ports which are always useful, they are round the back though which doesn’t make quick swaps too easy but at least they look tidy. The monitor features stereo 9-watt speakers but as always they don’t match up to the quality of an external system, I haven’t heard them myself but other reviewers mention the lack of base and poor stereo staging. But if you are a headphone gamer who wants the option of sharing sound from time to time then why not. The UltraSharp range holds itself to a high account, it tries to bring a superior image quality to the table, not just beating competitor but other Dell models too! Out of the box you get vibrant strong pictures with a high contrast. The image is sharp, obviously not standing up to 4k standards but very respectable. Professional reviewers praise the colour range but do highlight the presence of some back light bleed, however, it’s not excessive. Calibration reportedly improves the colour accuracy and brings up the standard further. There’s nothing in here that will single this out as a gamer’s monitor. It runs at a standard 60Hz, which, given the 1440p resolution., will be fast enough for many of our graphics cards. You’ll need something fairly powerful to top that at QHD resolution. You don’t get any adaptive sync technology here which will leave you open to tearing and stuttering if that frame rate does dip. But if you are a casual gamer, more interested in the super sized nature of this display then you may well be interested. After all, these extra features do come at additional cost. We give the Dell U3415W a 4.5 out of 5 rating. Want to know what existing owners of the monitor think? You can read real user reviews here. 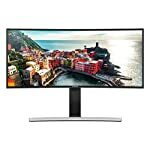 Should I buy the Dell U3415W? A high quality ultra wide screen from the trusted UltraSharp range of Dell monitors. 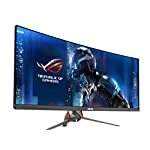 However more expensive monitors from other manufacturers do offer gamer specific functionality if you are prepared to spend even more money for the best performance. If you are having some doubts about this purchase then why not read some real owner reviews and see what other buyers think. Welcome to the Dell U3415W FAQ. This section attempts to answer common questions you may have, please get in touch if you have any more queries or if you think our answers need updating. Does it support picture in picture modes? Yes, like most of these ultra wide screen you can do picture by picture, that’s side by side views and also in picture. You can also plug in a compatible mobile device thanks to the MHL compatibility which would be useful for app developers or perhaps just to follow your Instant Messenger chats.